1. First, I ran out to both my local fabric store and thrift shop to find a pair of cheap jeans and some trim to work with. These Citizen of Humanity skinny jeans were only $4 and the trim was inexpensive as well. I got 1/3 of a yard and used only a small portion of it. 2. Crop the jeans to the length you wish. I also opted to split the side seam on mine as they were a skinny pair that didn’t have a lot of extra room in the calf/lower leg. 3. Determine how wide you want the embellished fabric band to be. 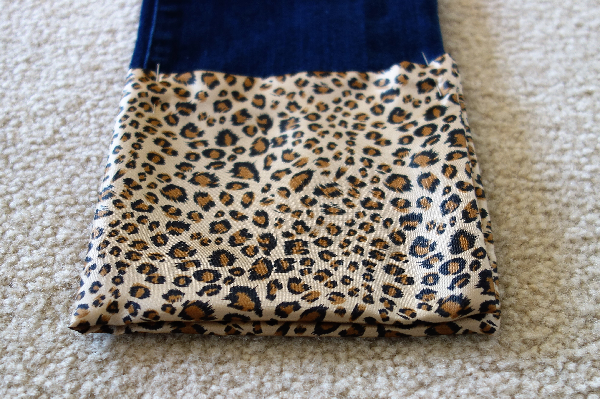 I chose 5″ and cut my fabric to 11″ since I was splitting the side seam and wanted the fabric to be visible from inside the jean as well. 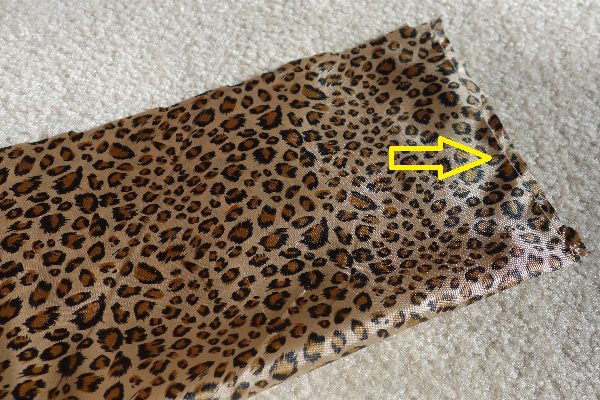 The extra 1″ was for folding down the fabric on the top hem of each side. 4. Fold the right sides of the fabric together and sew the two short side seams (wrong side of fabric should be facing out). Trim any excess to 1/8-1/4″. 5. Turn down the exposed edge fabric at the top about 1/2-1″ and press into place. 6. Turn fabric so that the right side is now facing out. 7. Attach the cuff to the bottom of the jean leg. This can be a little tricky so take your time. Match up the side seams of the cuff with the cut edge of the pant and make sure corners are flat and fully turned out. Pin in place. 8. 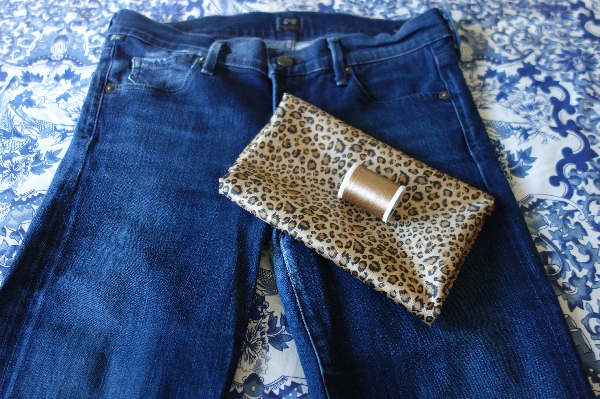 Sew along the turned down and pressed edge of fabric along the top, fully securing to the pant leg. Give one last press with the iron. 9. Repeat steps for the other leg. 10. Et, voila! 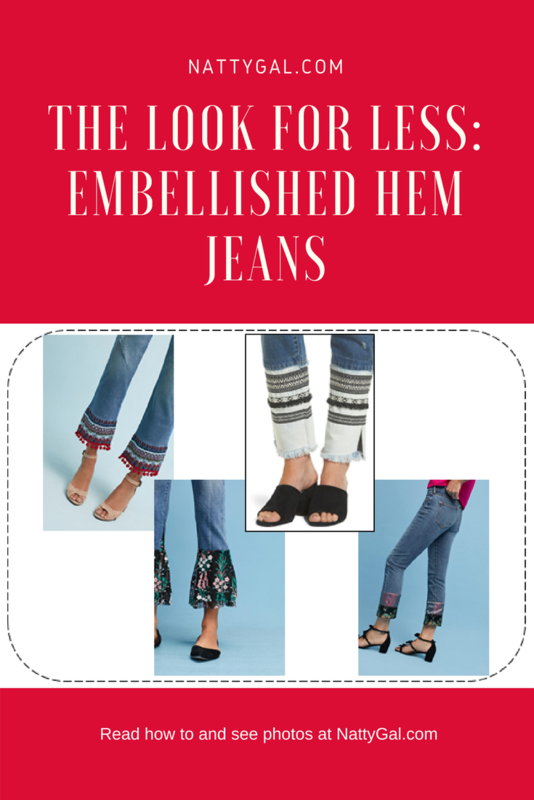 You now have an embellished hem jean! After seeing the fabric on, I’m tempted to take things one step further and add a row of black pom-pom trim along the bottom! In hindsight, this would have worked better with a straight leg or boyfriend cut jeans as they have a little bit more room to play with in the lower leg. Unless you are an experienced seamstress, look for fabrics that don’t have a large, obvious match to them. Have some extra fun by adding on a row of rick-rack or other trim. Also be mindful of fabric thickness. I found some gorgeous prints in the upholstery section of the fabric store but was afraid they would be too thick for my sewing machine, especially as they were being attached to denim. If you decide against splitting the side seam, I would recommend only turning an inch of fabric under the hem and sewing along both the top and bottom edges. For those without sewing machines, this easy project could also be accomplished using Stitch Witchery or comparable iron-on hemming tape. For a ruffled hem effect, cut the jean leg higher up. Gather the fabric prior to attaching to jean and sew it directly to the cut end with right sides together. To ruffle, using the longest stitch your machine offers and then gather along that row of stitching. I like to use about 50% more fabric length for ruffles but you may prefer a bit more or a bit less. 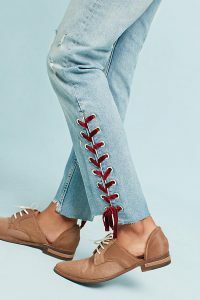 Bonus Idea: Split the side seam 8-12″ on a pair of jeans but this time, finish off the split sides with top-stitching so they stay together. Get some grommets and add along each side of the seam. Lace together with some pretty ribbon. 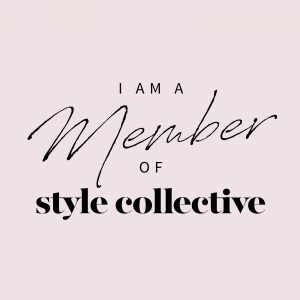 Another on trend and easy to DIY look! 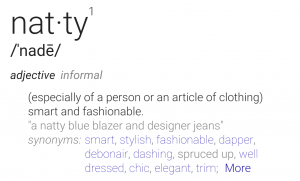 Have fun either re-purposing an old pair of jeans or getting the look for less with a thrift or discount store pair! For another easy DIY project, check out this post! I love this idea! They are super cute, and you did a great job making them! Thanks Julie! I think on a second try I’d use a boyfriend or straight leg jean for some more room but the method seemed to work out and that was what I was testing with this first go-around. Elizabeth, I absolutely love this DIY trick. 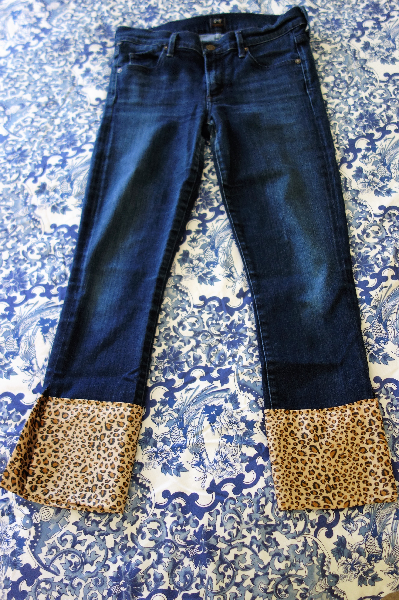 I wish I had a sewing machine because I would totally make myself a pair of embellished hem jeans right now. I guess I need to get some help from my friends! So cute. Thanks Shelbee! Try using Stitch Witchery. I love that stuff for easy hems and repairs. 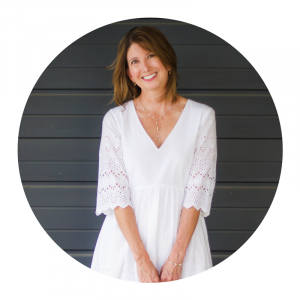 I was just telling Kat about this new look for jeans that you have on the blog! We haven’t seen any yet at the stores but I know we will find them. This is a great idea for the DIY ladies out there. Thanks Carrie! I’m not particularly crafty and found it simple to do so should be in the range of most people!